It had to be named the “Icelandic” because the color reminds me of winter white, and the blanket is warm enough for the coldest of days. 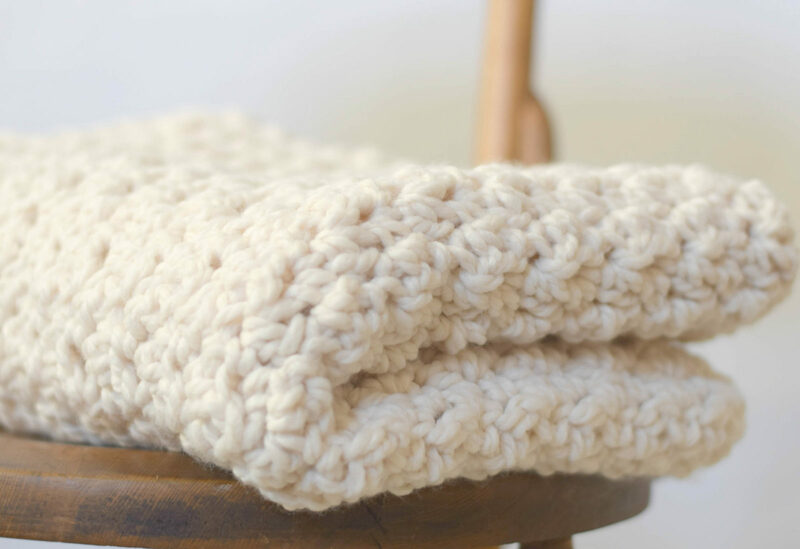 The texture is so incredibly cozy and it is one of the easiest stitches I’ve ever done. You literally alternate single and double crochet stitches, so if you are a beginner, this is completely doable. By using a slightly larger hook than what the yarn calls for, it came out with a really nice drape and emphasized the chunky, bubbly texture. I didn’t know what stitch this was until someone on Instagram mentioned that it is called the “Lemon Peel”. I went ahead and looked it up on YouTube and indeed, this blanket is done completely in the lemon peel stitch. Just love it! It’s also pretty cool because Lion Brand just came out with their new Wool Ease Thick & Quick Bonus Bundles. Each skein holds the equivalent to two skeins of the original skeins. This means less weaving in ends which is a major bonus in my book. You can find these bonus bundles on Lion Brand’s site, on Michaels website and in select Michaels Stores as well. 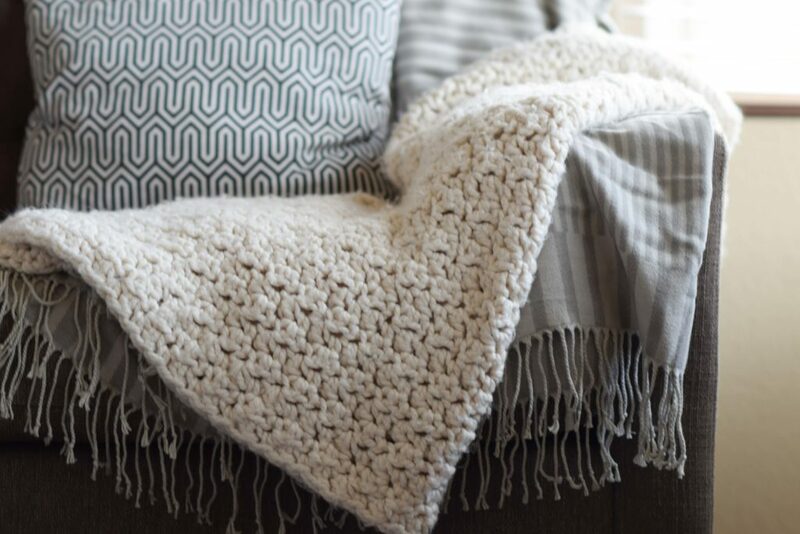 This blanket is 36″ x 40″ making it a nice, small lapghan or toddler size blanket. I have been into the lapghan thing lately because I think it’s a nice size for a small space, however, I plan to continue working on this blanket to make it a larger throw. 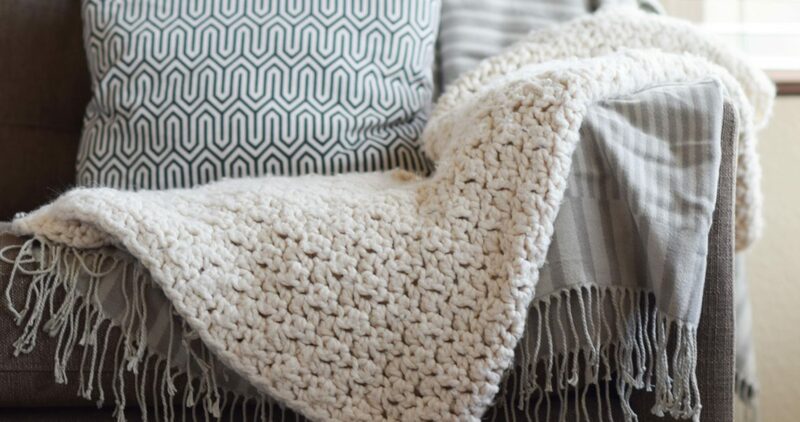 You can make this blanket as big or small as you’d like though. As far as I can tell, if you chain an even number of stitches, you can simply adjust the length of your chain to a smaller or larger size. Then follow the pattern and crochet to your heart’s desire. I’ve made a convenient Blanket Sizing reference page that you can see HERE so you know how long to make your initial chain depending on the blanket that you want. Obviously, for a full afghan you will need to buy more yarn! 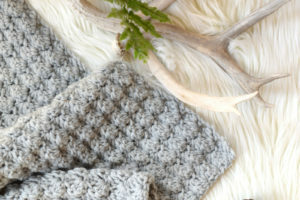 Scroll down for the free pattern or…. 6 skeins of Lion Brand Wool Ease Thick N’ Quick in Fisherman or comparable super chunky yarn or 3 of the new Bonus Bundles! Row 2 Sc in 1st 2 stitches, *dc in next stitch, sc in next stitch. Repeat from * across. Sc in last stitch, ch 1, turn. Row 3 Sc in 1st stitch, *dc in next stitch, sc in next stitch. Repeat from * across row, ch 1, turn. Now I’m working a row of single crochet, and then double crochet stitches. Here’s a single crochet. 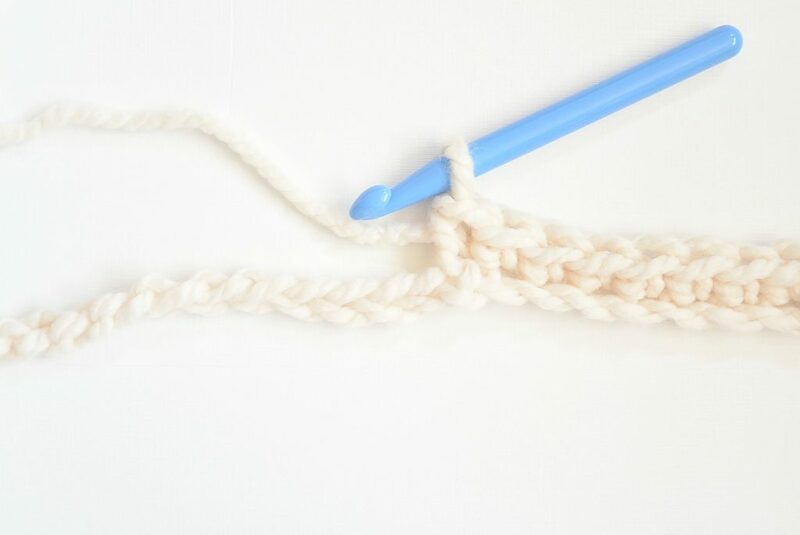 After a single crochet, you make a double crochet stitch. I think this would make a wonderful and thoughtful gift for just about anyone. It would be really cute to add some pom poms to the corner to make it more playful. You could even add some tassels if you’d like. Let me know if you think you might make one! Feel free to share your pictures with me on Facebook or Instragram and tag me @mamainastitch! This blanket works up quickly and is squishy and warm so it was quite enjoyable for me. What types of blankets do you enjoy making? I’d love to hear any of your thoughts on this one or your blanket projects in the comments below! That stitch is so pretty! I’m planning to make a batch of baby blankets soon, and you have just provided me with the perfect pattern. I’m so glad that you like it. It would make a lovely baby blanket for sure! Ummmmmm you have 4 stitches and 3.5 rows equals 4 inches? Is that correct? It sure isn’t Darlene! I initially measured for a different amount in inches and then it got all jumbled. I’ve corrected it above. Thank you for bringing that to my attention. I think it would be SO NICE in a chunky chenille! I am so happy to hear you say that because I’m getting ready to start an Afghan for my grandson and I believe this is the Perfect Stitch. he even chose the yarn. BERNAT-Super bulky Country blue. I will let you know how it turns out. Thank you so much for sharing! Hi. I haven’t crocheted and would love to start. I do however knit and would love to take up crocheting especially after seeing this blanket. Do you have a tutorial on crocheting? Im just a little unsure about single and double stitches!!! You should give it a try if you think it’s something you’d like to be able to do! I will find some YouTube tutorials tomorrow to post here that might help you out. YouTube taught me to crochet, so check back and I’ll share a couple links. Love your blog. Enjoy seeing your projects. Please tell me the yards amount used of yarn. What a great blanket. I see a throw from this pattern in my future! Thanks Buffy! I think your fam will be happy with the throw. Enjoy! I bought this yarn for a different project that I wasn’t crazy about once I started. That yarn has just been sitting there waiting for THIS pattern!! Thank you so much!! Ha ha! So happy to hear you’ll get to use up that yarn. You’re welcome of course! Wish I could print this pattern. I’m in the process of creating a PDF that you will be able to print for a small price. It should be up within a month or so. Until then, you can always copy and paste it into a Word doc and print from there. I hope this helps! Beautiful! I’d love to try this for a Christmas gift! I’m new to crocheting but an avid knitter and I love blanket projects! Do you know about how long it took you to make this one? It’s always hard for me to say how many hours exactly. I feel like I worked on it for probably two full days, staying up late at night and part of a third day. Of course it would take longer to do the full afghan size. I’m also not the fastest crocheter – I’ve seen people much faster than me. Hope that helps! Thank you! I’m recovering from flexor and extensor tendonitis from typing and knitting so often, but hoping to be able to make this for a Christmas gift this year! Beautiful! Cannot wait to get started! Jessica, did you put a border on it? Or does it not need one? Hi Liz! I did not, mostly because I plan to continue working on it as time and budget allows. I want to make it a bit larger. I don’t think it needs one, but would be pretty with a border as well. I hate the feel of this lion brand yarn. I would like to know if I can use BULKY weight yarn instead? 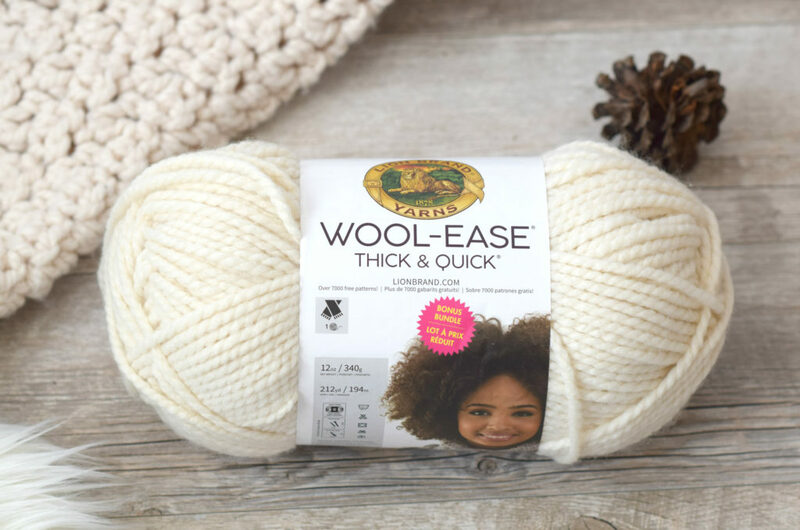 You can use any yarn that you’d like as long as it’s the same thickness/weight as the super bulky wool ease thick & quick yarn. Enjoy! 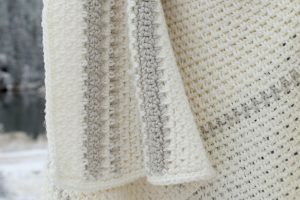 I am making this using Bernat Baby Blanket Yarn Stripes and a P-16/11.5mm crochet hook and it is turning out beautifully! Wonderful Lynda! Thanks for sharing! Is it a row or single crochets and then a row of half double crochets amd repeat or a row of single crochets and then one single crochet, one half double crochet till the end? Hi Polly! You alternate one single crochet, one double crochet across the row. So you aren’t alternating the rows, you are alternating each stitch across the row. I hope this helps! You can also look up the “lemon peel” stitch on YouTube and see how it’s done. Thank you so much, I just started the blanket and the result so far is beautiful! For the fourth and subsequent rows, does the single go into a single and the double go into a double or vice versa? Single into double, double into single. Can’t wait to try this one…this stitch has intrigued me for some time since no one seemed to know what to call it. I’m not sure where it got the name Lemon Peel but that makes it easy to remember. Love the blanket. Hi there. Love the pattern. I have a worsted weight cotton that is so cozy that I’d love to use. It is not exactly “chunky” though. Could I use it for this project and if so, what size hook would you recommend? Hi Shannon, You could do a blanket with this same pattern and worsted weight yarn. Of course, you would have to make many more chain stitches than this pattern calls for to get the right size, and it will not have the chunky look. You should use the hook size that the yarn indicates on the label. Usually a US Size H hook will work with a worsted weight yarn. I hope it works out well for you! Enjoy! As a male knitted and spinner in a very remote part of Australia I am in awe of the close proximity some people are to a variety of craft outlets. With just one such store in town here there is a very limited supply of yarn and at a higher price than is often affordable it is quite frustrating to have to choose 100% acrylic yarns that merely just have bright colours to their advantage. Hence my need to continue spinning and hopefully be ultimately successful in achieving dyeing excellence. Hopefully also in future I may also achieve a much higher level of success with the artistry of crochet which right now is at pre-school level. Tuition in crochet is definitely in serious need here and difficult to find. With limited knowledge of the internet I feel at a loss for the guidance I need. Any thoughts on a pathway to success in learning crochet would be greatly appreciated. Where there is a magnifying symbol left click on it. It will highlight and the cursor will start to flash. Type in what you want …. there will be lots of links come up. Alternatively, go to Pinterest (www.pinterest.com) and put a search in there. You need to check whether the pattern uses US or UK terms as they are different. I think Oz uses UK terms. Look for UK double crochet (= US single crochet) and UK treble crochet (= US double crochet). There are also some tutorials on here which are in US terms. Beautiful blanket pattern. Great follow along instructions. I’m starting a baby blankets for my nieces new baby using this pretty stitch, and thanks to your blanket sizing, I plan on making a toddler sized one for big sister. 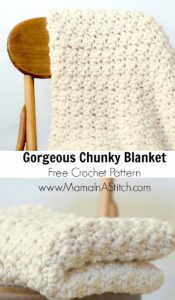 Thank you so much for sharing this beautiful blanket pattern. You’re welcome Nancy! I’m so glad that you are enjoying it and that the blanket sizing guide was helpful too. I really appreciate you taking the time to let me know! I have been wanting to use up my scrap yarn and wandering how this would look with switching colors. I was thinking of switching colors in the row and not just at end of row.. What do you think? Hmm, you could always give it a try and see what you think! I’m more into switching colors at the end of a row. But you could probably make a really cool and different type blanket doing it with your method! I’d love to hear if you try it. Do you have a YouTube video on this? I think I understand the sc then dc, but just not sure about how to do the 2nd row and not sure what the * is. I would love to make it but I think I would have to visually see the first few rows. Thanks for sharing! Here’s a good one that I found on YouTube. Hope it helps! Hi Carol! Thanks so much for taking the time to write me. I’m so happy to hear from you that you enjoy simple patterns just like I do! The lapghan is a favorite of mine too and is already being used more than almost any project that I’ve made here at my house. 🙂 I hope you will like the finished blanket as much as we do. Thanks so much for signing up to get my emails. 🙂 It means so much to me! Have a wonderful weekend Carol! Looks like a Q hook in the picture. The P hook in that set is gray?? Hi Robin – The Q is the largest hook in the set of we are talking about the same set of hooks. Hi! 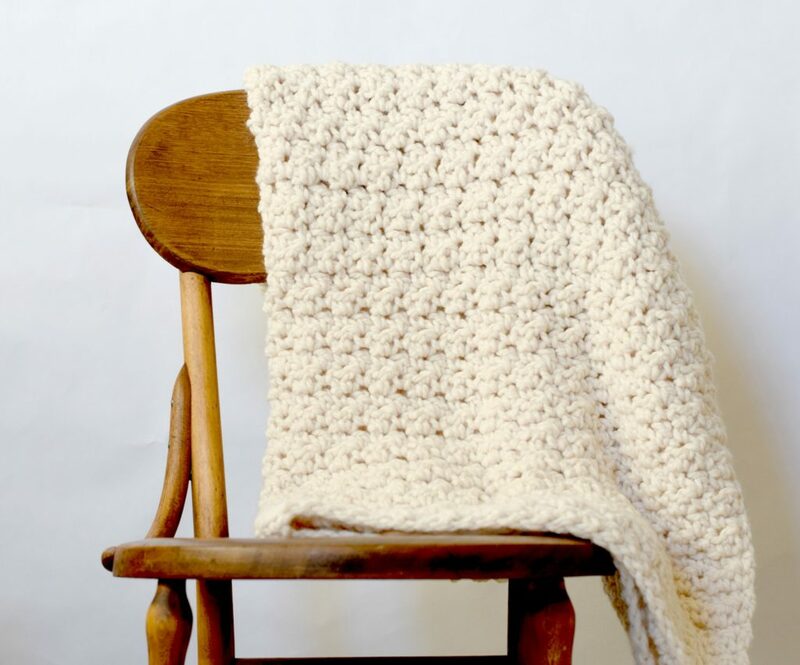 I’m currently working on a blanket with Bernat Home and I’m thinking of using the same yarn for one of these. I love simplicity and this is right up my alley!!! Thank you for sharing. Yay! I hope you enjoy it. You’re welcome of course – I’m happy to share! hi! thanks for your pattern. i will be a great grandmother for the first time and would like to make a blanket to wrap the baby, and like to kmow if i could us baby yarn (3) insted of bulky yarn which would be to thick for this proyect. thak you again for shering and waiting for your answer so i can start the blanket. You’re welcome Dina! Congratulations on being a great grandmother. What a blessing! 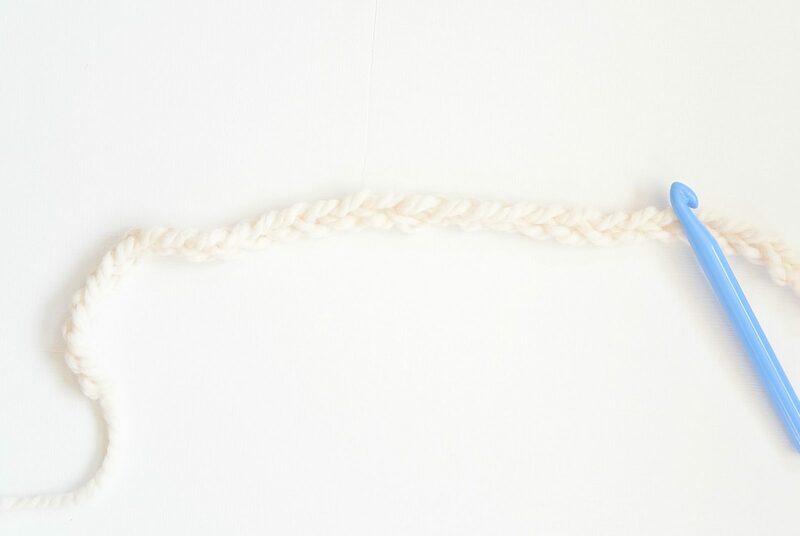 You can use the baby yarn for sure, but of course you will need to start with a much longer chain and a different size hook. Just be sure to use an even stitch count. I hope it works for you! I just finished the Chunky Icelandic Crochet Blanket but I had a little trouble with the instructions. When I did it the way the instructions read (or at least the way I read them) it wasn’t coming out at all like the picture so I kind of did it my own way. I love it! The instructions gave me the basis for what I did end up with. I love your ideas and usually have no trouble. I can’t wait to make my next project. Not sure what it will be but thank you for all the wonderful ideas!! Hi Patt! If you get a chance, can you tell me the part that was tripping you up? Or let me know what you did differently? I want to be sure the instructions are clear for everyone! I love this pattern! Could you give me an idea of size and yardage for a full size afghan? Hi love the pattern! I’m going to try it but have one question. You state the P hook but yet the photo shows the Q hook. Which one is to be used? Thank you! The Q hook is the largest in my set, and this blue hook is my P hook. What set are you using? There have been a few questions about this, so I’m hoping to make a note in the pattern somewhere. Thanks so much! Hi! Thanks for writing back. I have the set by Boye. The P hook (11.5mm) in this set is gray and the bigger/longer hook is the Q (15.75mm) hook which is blue (same color as your P hook). I guess hooks aren’t universal in color/size? I’ll try this with the P hook. Again thanks! How funny! So mine is a Boye set “The Crochet Dude” set and the P 11.5 is medium blue and the Q, the largest 15.75 is a light blue. I guess there are a couple different sets out there. Good to know! Yes, definitely good to know! I went and bought the yarn you listed above and I’m starting on it now. My only concern is how will I keep track of the rows that get two sc? I tend to lose track even with counting. Hi, I started this blanket. One question though, it looks like you used the Q hook (which is blue) in the photo but you mention using the P hook (which is gray). I started using the P hook as directed but I don’t seem to be getting the chunkiness that is in the photos. I am using a chunky/bulky yarn from Lion Brand. Thank you. This is the P hook in my set from Boye The Crochet Dude. I’m not sure which set you are using, but maybe make sure the mm is the same as mine? 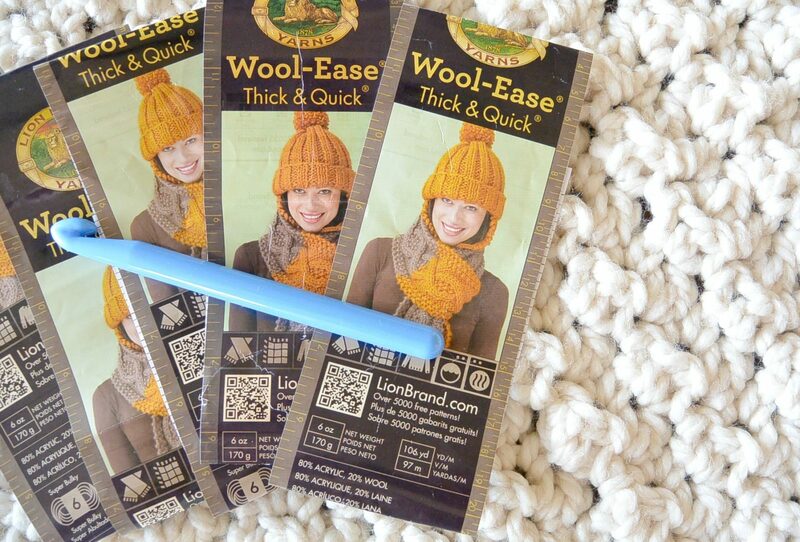 Also, you mentioned the LB chunky – I’m assuming you’re using LB Wool Ease Thick & Quick Super Bulky? Hope this helps! hi Jessica! thank you for your fast answe. haveaan other question where could i get free patterns for baby booties and swatters, etc? I just made this blanket in 2 days. I have never crocheted before. I did stuff up the first go, but got it right on the second attempt. SUPER EASY. Thank you for the pattern it turned out beautiful. Hi Tania – wow! You’d never crocheted before?! That’s some talent. I’m so happy that you like how it turned out and that it was easy enough to follow. Thanks so much for letting me know!! I am home bound/disabled and I needed a simple project to keep my mind off of my current situation. I have some Bernat blanket yarn (vintage white and purple plum) that I have been fighting with for over a year. So much so I threw it in my closet and vowed not to touch it again. I could not find the right pattern to accommodate such a thick soft squishy yarn. Until the other day when I googled patterns for super bulky yarn. I saw your pic of this beautiful blanket and I just want to say THANK YOU!!! Thank you so much for posting this pattern. I have a while to go but so far it looks really nice. I’m so happy to hear that you think this pattern will work for your yarn! I sure hope you enjoy it. Made a baby blanket with Bernat baby in white, and now I’m starting an afghan in vintage white! So easy!! Thanks for the pattern! That’s awesome! Thanks for sharing Robin. I’m so glad the pattern has worked out well for you! Hi Doreen, I just crocheted as normal. I didn’t go through the back loop for this blanket. Hope that helps! Maybe a little late to reply now, but I also had a ridge when I began because I was going through just the front of the stitch. By poking the needle through the front and the back, there’s no ridge. I just made a very similar blanket (same stitch pattern) holding two strands of thick and quick together using my size U hook. Btw if you need a chat for the stitch pattern it is number 27 in the complete book of stitch designs by Linda P. Scrapper. My website is just my Ravelry page with pictures of this project. 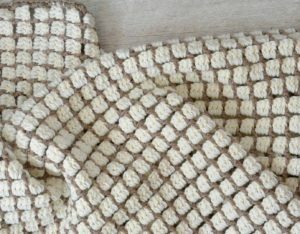 I’m pretty new to crocheting, but I’d love to make this blanket for a gift! However, I’m not a big fan of the Super Bulky yarn! Do you think it’d work if instead of super bulky, I just used bulky yarn with a slightly smaller hook? Definitely! You will just have to make it larger with a longer chain and more stitches to get the same size of course! Enjoy! I just finished my first crochet project for a friend having a baby and have been itching for a new project. I found a beautiful chunky wool yarn at Michaels in pale lavender…and think this pattern would make a great Christmas gift for my sister-in-law! Thanks for sharing, will try to post on Instagram once I’ve finished. Hi Jess – that color combo sounds gorgeous. I’d love to see a picture for sure! I hope you enjoy it and let me know if you have any questions! I have started this pattern for a blanket size twice now and keep second guessing and starting over. The pattern says to sc and alternate with dc which I understand. I am confused about which sc you used. Usually if the pattern says sc then it means to use both loops of the prior row. If the pattern says scbl then you use the back loop only and if it says scfl you use the front loop only. In the comments you state you “crocheted as normal” but also say you “didn’t use the back loop”. So I am not sure which sc you mean for this pattern? Also, just to confirm, are all the dc done in both loops? Since I am making this much larger than the lapghan size, in row two you say to sc in first 2 stitches and end the row with sc. For row three, you say sc in first stitch but doesn’t give what the end stick should be. Should this change depending on the size of the starting chain number? Before I rip this apart for a third time, I just want to make sure I am doing it correctly so I won’t keep questioning my progress. Thank you very much for any clarification you can provide. Hi Dena! Hope I can help! Just crochet as normal, that’s why I call it an sc. I was clarifying in the other statement that you mention about not going ONLY through the back loop. You simply crochet as normal. 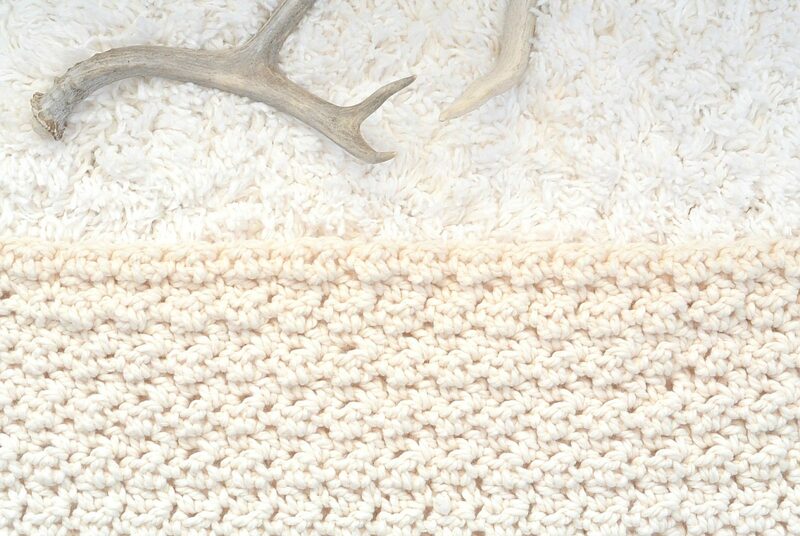 Just so you don’t have to start a huge blanket and rip it out again, you might want to practice on a smaller swatch. Just be sure to keep an even amount of chain stitches. This way you can make sure that you’re doing it right before you start your big blanket. Hope this helps! Was thinking of using Q hook with Bernat Baby Blanket yarn and Bernat Mix Home to add a little color/stripes. Do you think that would work? For a full/Queen size was thinking of 144 chains to start. Do you think 3 Big Ball Baby and 3 Bernat Mix Home 8 oz balls will be enough yarn? Im a beginner so how do I figure out when to switch colors or do you just wing it? Thinking of making this for a double/queen bed using 144 chains. Im using Q hook and bought 3 Baby Blanket Bernat Big Balls and 3 8 oz Bernat Mix Home to add a little color/stripe. Do you think that will work? Is that enough Yarn? How do I figure how where to place the stripes? This is a great squishy blanket! By the way, when you use this stitch pattern and you use two different colors – one row each color, it turns out looking like houndstooth. I made a scarf in black and red. It’s one row red, one row black, and it forms a houndstooth pattern. To prevent cutting the yarn at the end of each row, I just carried it along the row and crocheted over it. Cool, huh? Morning! I made this. It is lovely I used Cygnet Seriously Chunkey Fawn UK size 10 hook. Chain 64 and then used 18 balls. Help! I have crocheted many hats but never a blanket; it looks like my blanket is growing as both ends are headed outwards from my chain as I am working the row 2-3 repetition. Is it normal for it to just APPERAR to be growing and then tighten up as you work the pattern or have I made a mistake somewhere? It’s hard to say if it’s growing or not….sometimes your tension loosens as you work, but you could be increasing on each row. 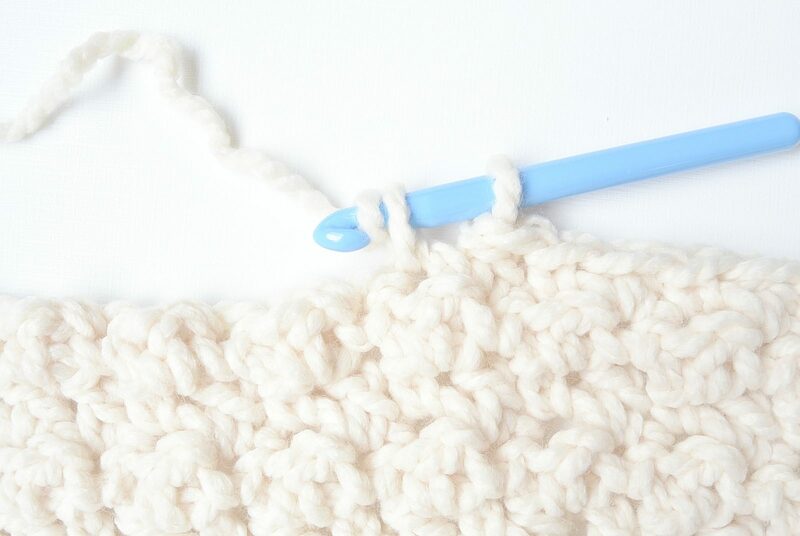 Be sure to count your stitches and make sure you’re not adding as you go along! I’ve started on this blanket and as I progress it seems to be growing. Doing 2 sc in the first 2 stiches on row 2 and 3 sc in the first stich on row 3 seems to add stiches. Am I doing something wrong? It definitely shouldn’t be growing. Definitely do a search in YouTube on how to crochet the Lemon Peel stitch and I think it may help you see how it’s done. Hope it helps! I am finding the same problem. If you follow these directions, on row two you would be adding 2 stiches and row 3 would add 2 stitches as well. The video does not show this as it just turns and begins with the alternating sc and dc. Are some of us reading this incorrectly? I absolutely love this pattern. I made it with the quick and thick Hudson Bay and it came out beautiful. This is actually the first one I actually completed. Hi Janene! Thanks for sharing ! I love the Hudson Bay color. I’m sure it turned out gorgeous. So glad you’re happy with it! This is a beautiful blanket but you didn’t include the finished size. I would appreciate it if someone would to give me those measurements, please? Hi – this looks like a pattern my mother made a couple of times. I’d like to make a baby blanket but I’m afraid it will end up heavy like a rug. Would I use a different yarn or does this one drape nicely? I like the drape, but I am a loose crocheter. 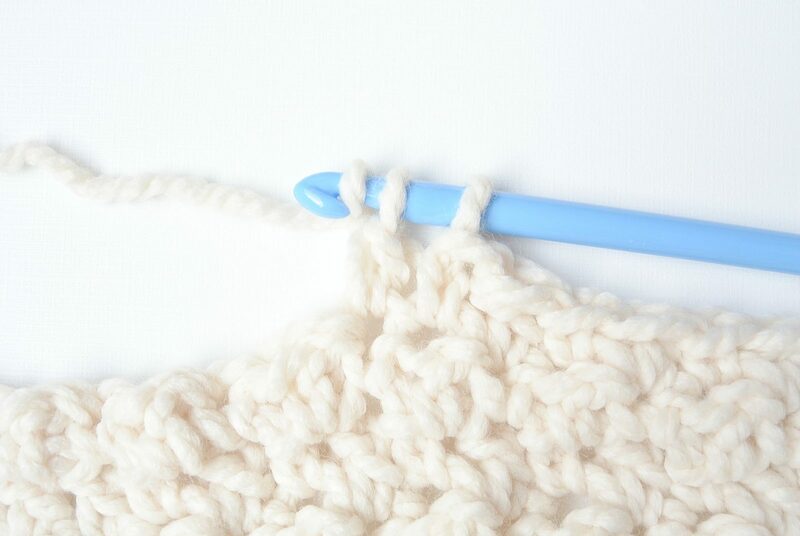 If you crochet tightly, you might consider going up a hook size. Just a thought! I’ve never crocheted, but want to learn. Would this be too aggressive for a first project? If so, what would you recommend? Hi! You should learn as it’s a fun and addictive hobby! However, this blanket is a bit too much for someone who has never crocheted. First go to you tube and search “how to crochet”. Get the single crochet stitch down and the double crochet stitch. Once you’re good with those, come back here and you can try out the blanket! Enjoy! I love the chunky Icelandic blanket pattern and have made 3 blankets- one each for me and my 2 daughters – all in slightly different sizes. It’s so cozy and warm! Thanks for sharing this wonderful pattern! So cool! I’m so happy you’ve enjoyed making it Jill! Thanks so much for letting me know. 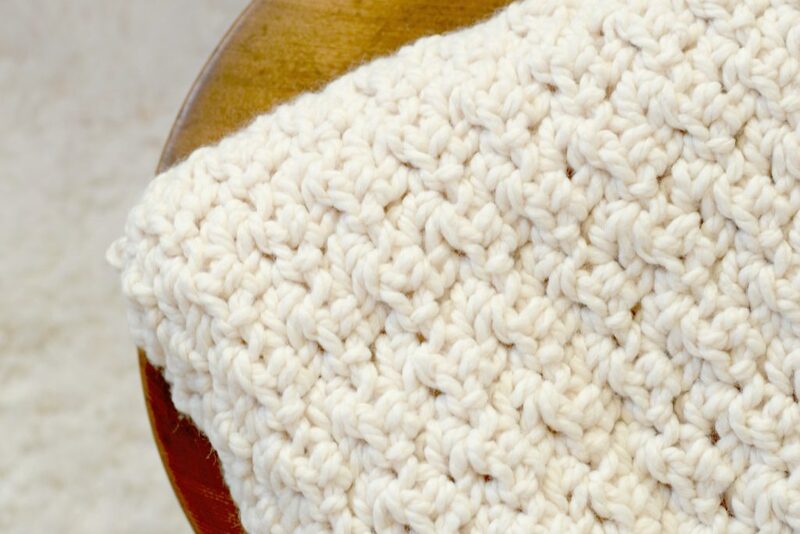 I’ve used this stitch combo for TONS of blankets. However, I do it a little differently. Using whatever size yarn you prefer and the hook size recommended on the yarn package. Chain an ODD number of chains to attain your desired width. Turn your work. SC into the 2nd chain from your hook. DC into the next. *SC, DC* to the end of the row. Chain one & turn your work. •Every row begins with a SC & ends with a DC. •Every SC is stitched into a DC from the previous row. •Every DC is stitched into a SC from the previous row. Once you’ve reached your desired length, finish with a final row of SC. A border is optional and many options are available & demonstrated on YouTube & other sites. I find this slight variation easier just because I don’t have to keep track of “odd & even” rows. Of course, a gauge swatch is necessary to determine the number of chains, rows & amount of yarn required to reach your desired blanket size. •Row 1: SC into 2nd chain from hook. *DC, SC* to end of row. (Final stitch should be a DC) Chain 1 & turn. •Row 2-?? : *SC, DC* First stitch always SC & final stitch always DC. Question can you tell ne how you wash and dry this? I’m not great a time that stuff and don’t want it to fall apart or shrink!! Does it get softer with washing? This is my first crochet and I love it!!! Making it 48×60 and am almost finished! I have washed it in cold on gentle cycle. I wouldn’t wash it over and over again, but it has held up fine after a few times! Did you put it in the dryer? Hi! I’m sorry I just got confused for the chunky Icelandic blanket… should row 3 end in a double crochet? I am just about done making this, except I made mine huge ! It’s so cozy and heavy and has such a good drape I’m obsessed. I’m going to do some baby versions in different colours ! I made this and just finished last night. Made mine much bigger and longer since it is a gift. I loved how easy it was. I have also made another afghan on this site and will next be making the Mod Heirloom blanket as a wedding gift. Everything I’ve made from this site is great! The instructions are easy to follow, the pattern is easy but the project comes out looking like it was much more complex. Really love your blog! Two questions, 1. Should both rows be ending in a single stitch? (My first blanket sometimes was ending with two singles or a double on the Row 3) 2. Does the chain one count as a stitch ….meaning should my first stitch of each row go into that space ( or into the next/first actual stitch). The first lapghan I did I fudged it, but I’m doing another and want to make sure I have it right. Thanks so much . Yummy blanket!!! Are you to end up with a single cs at the end of each row? Because one row is a single, and the next ends in a double. Hi Jessica! I was inspired to start learning the art of crochet after seeing this blanket. Now that I’ve done a scarf and a couple of hats I feel like I am ready for this one – finally! I am considering playing around with color adding some stripes. 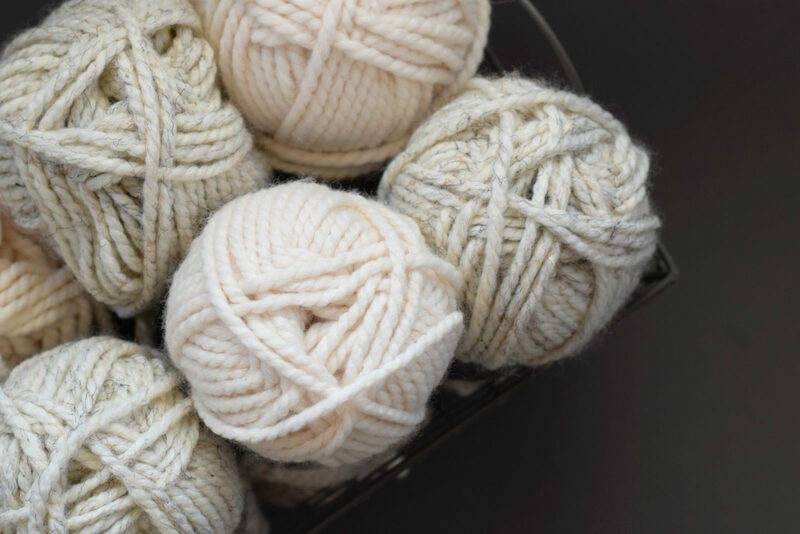 To buy enough yarn – is there a way to know how many rows you get out of 1 skein? Maybe you remember how many rows the lapghan is in total? I could do the math. Also after finishing are there any leftovers, to make some tassels? What a great pattern! I just finished my blanket which will be a wedding present. Thank you. Thanks so much for your wonderful pattern! I used 6 of the large balls of Wool-Ease Thick & Quick in Fisherman colour to make a full-sized blanket ~4ft x 5ft. I added a border (to finish up using the 6th ball of yarn). It was 1 round of single crochet, then turned and did another round of single crochet, and then continued in same direction with a round of slipstitch. The blanket is so thick and warm and cozy! This is a great pattern! I’m part way through, but I have a question: Is every row supposed to start and end with a SC? Is that supposed to create a border as you go along? Because I would think every other row would end with a double? Am I seeing things that aren’t really here? I remember seeing a video of the basics of making this pattern. I love the pattern but I looked up the Lemon Peel stitch and it says to always start the chain with an even number but you pattern says to chain 58 which is not an even number. Great looking throw. The “Lemon Peel” stitch is well known – but just one thing is missing in your written pattern. In patterns, “+1” is added to the original chain of “even amount of stitches” if you want to end up with an even amount of stitches in your gauge. That beginning plus one is your first single crochet. I think this is important clarification info for the beginners – as we all were at one time !